I have a very easy project for you with a huge WOW factor. 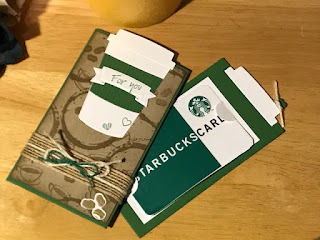 I'm looking for ways to give gift cards that's creative and not run-of-the-mill. Check out my coffee themed gift card holders. 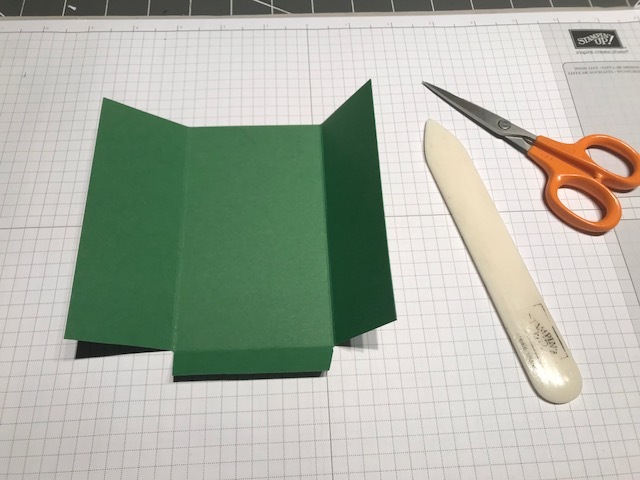 The gift card holder fits into a standard A2 envelope and each holder holds a standard credit card size gift card. 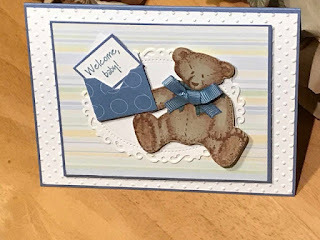 Below are the step by instructions and exactly what you'll need to make this project. 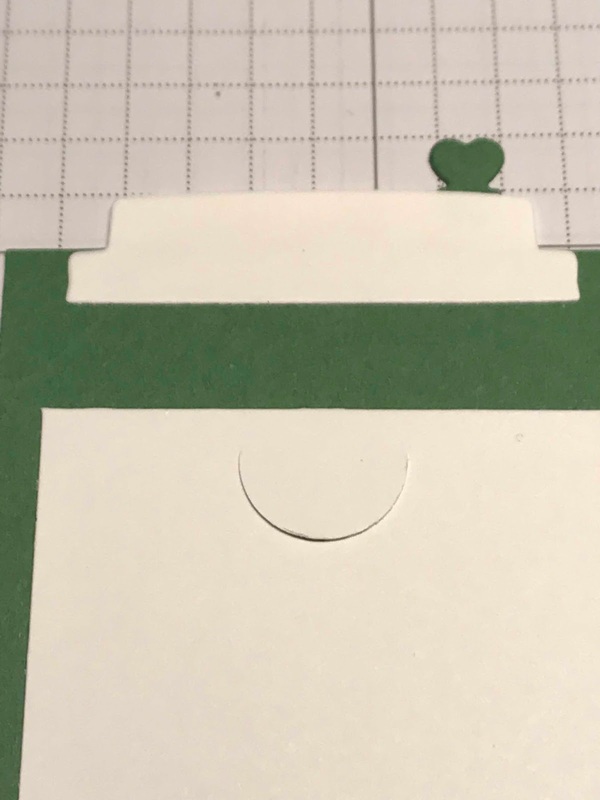 Step 1: Score base cardstock at ½” along the long side; score at 1 1/2 and 4 1/2 on the short side. Trim away the 1/2” scored section on the 1st and 3rd panels. Step 2: Die cut in white, coffee cup and 3-lids; in base color die cut the stopper and cup wrapper. Stamp For You on white and use a label or banner die to cut out. Step 3: Stamp a background on the front and back cover using the same color of ink as the paper, using a collection of coffee themed stamps. Sponge same color around the edge of each panel and in the middle. Step 4: Assemble the holder. Add adhesive or score tape to the outside of the tab at the bottom of the center panel and fold up. Add glue to the very edge of 1st panel. Fold panels on top of tab and each other to make a sleeve. Let set for a couple of minutes. 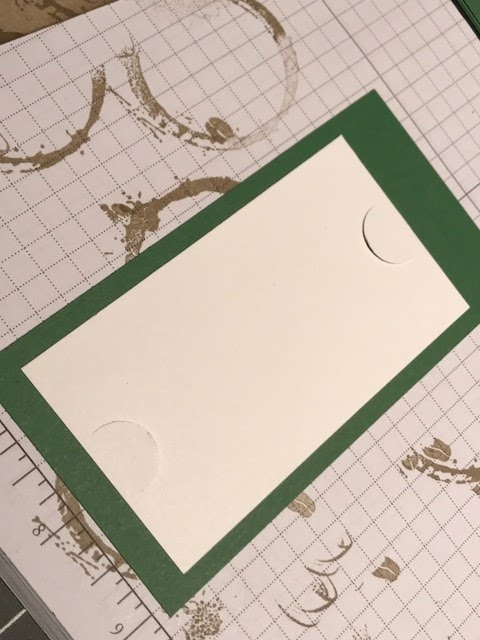 Step 5: Using a half-circle punch, cut two slits at each end of the gift card panel. Glue on top of the insert panel centering. Step 7: Adhere the front and back panels to the sleeve. 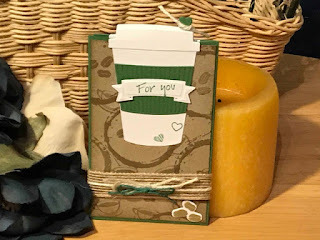 Glue the cup wrapper to the die cut coffee cup. Attach to the very edge of the cup, the last coffee cup lid. 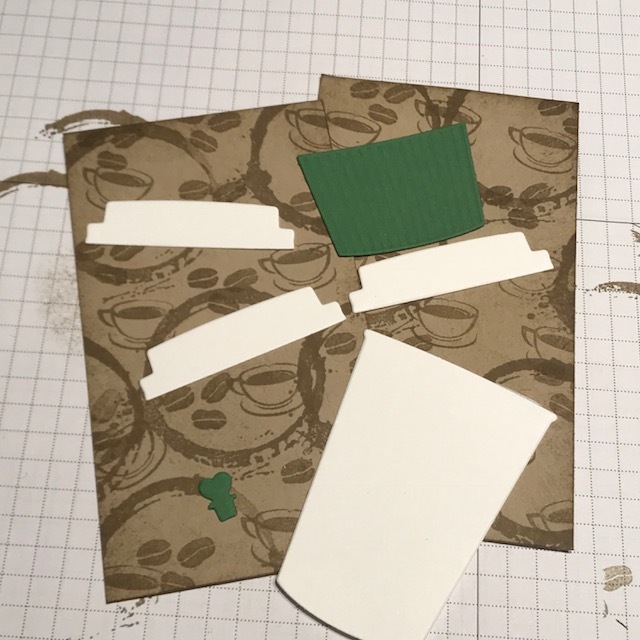 Center the die-cut coffee cup at the very top of the front panel and glue down. Add the embellishments to the bottom front of the sleeve. 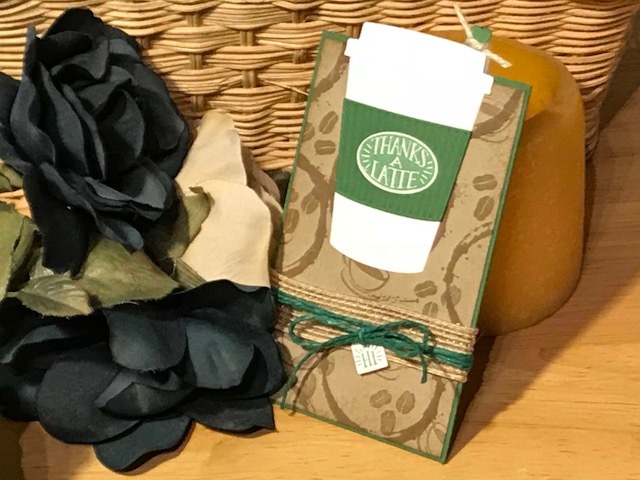 Attach a ribbon or jute string to the stopper – this becomes the pull to reveal the gift card. 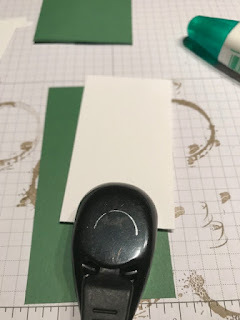 Step 8: Using the same coffee theme stamps as you did for the front and back cover, stamp in the lower left-hand corner of the envelope (makes a nice coordinating envelope). Here's a slightly different version. 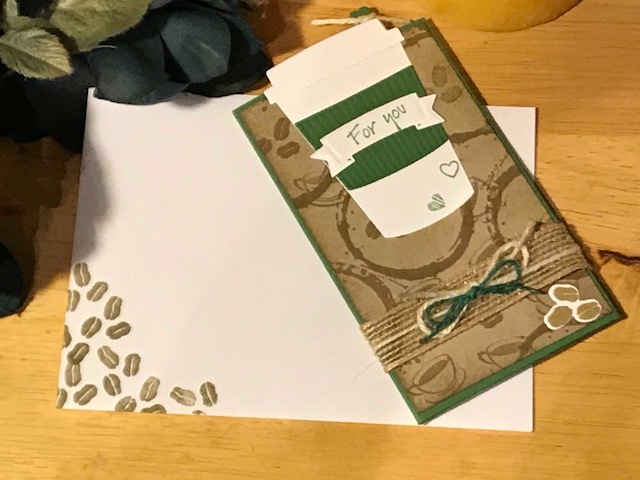 This one is a thank you gift. I hope you give this a try. 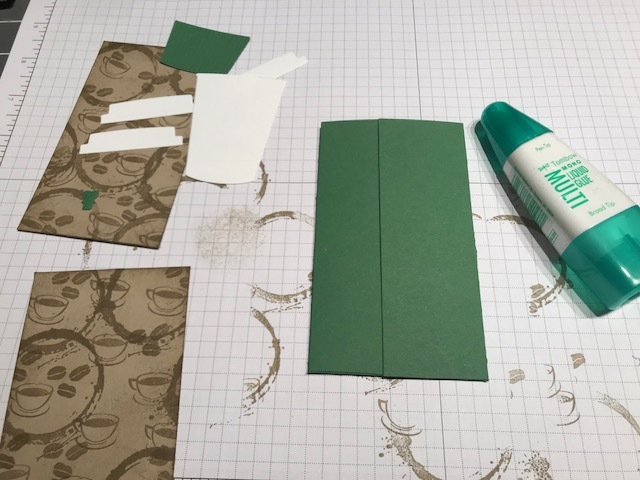 One tip - do all of your die cutting at the same time. This will help you keep track of your die cut pieces as well as save you a little time.